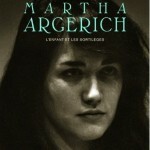 If you read French, Martha Argerich : L’enfant et les sortilèges by Olivier Bellamy from Radio Classique is a must-read. Buenos Aires at the end the forties and fifties is a paradise for musicians and music lovers, and the ebullient scene where the seven-year old Martha Argerich makes her debut. It’s the starting point of the phenomenal career of this immensely gifted and free-spirited pianist with her “Nouvelle Vague” looks throughout the decades. The book is wonderfully documented (yet not pompous) and extremely well written. I wrote a more detailed comment on Amazon.fr. no existe una traduccion al español de esta biografia de Martha Argerich ???. The translation in spanish is in process in South America. So in chinese, japonese, in german, but not in english !!!! Funny, I just saw Martha’s photo on an album from 1976 – http://bit.ly/TyijJD – so I started reading about her. I didn’t know what Nouvelle Vague meant and then I realized it was the New Wave French cinema.